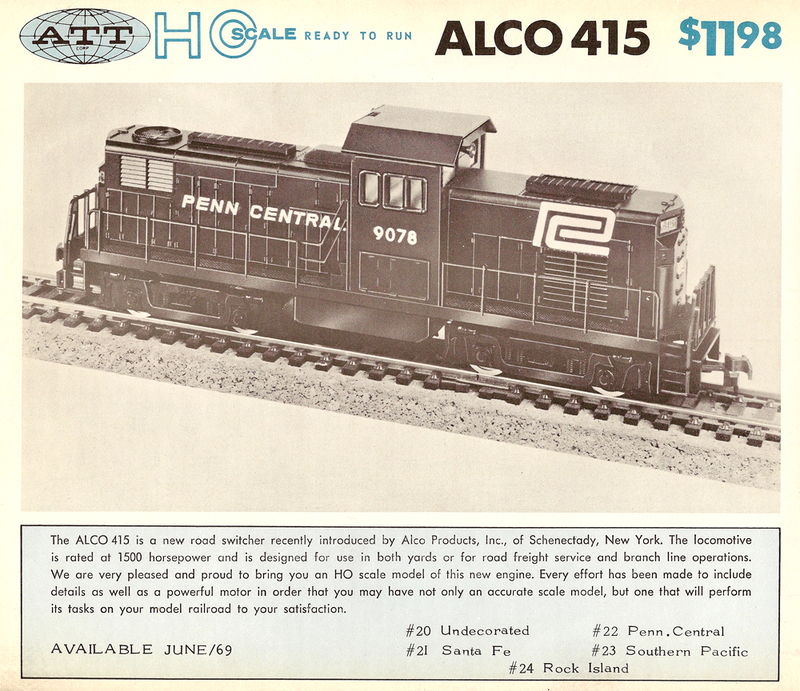 Not long after Alco’s mid-1960s introduction of its unique near center-cab entry in the Century series of diesels, American Train & Track (ATT) introduced an HO-scale version to the North American market. 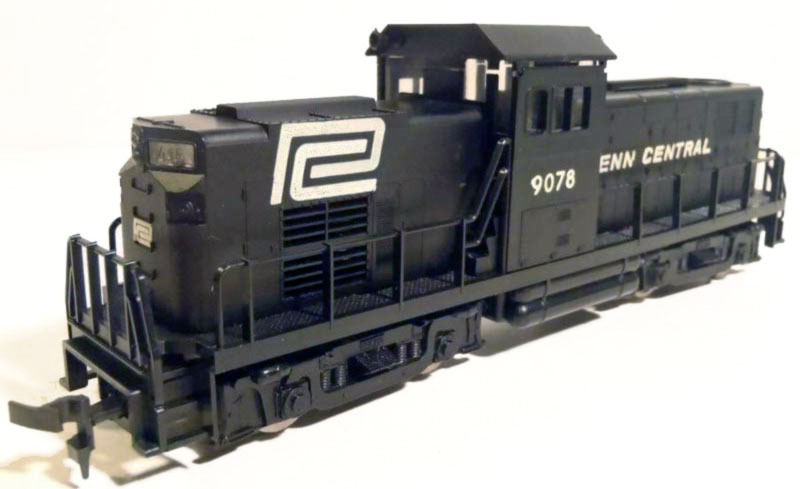 Alco diesel prototypes command much attention and interest for modelers and this prototype is no exception. 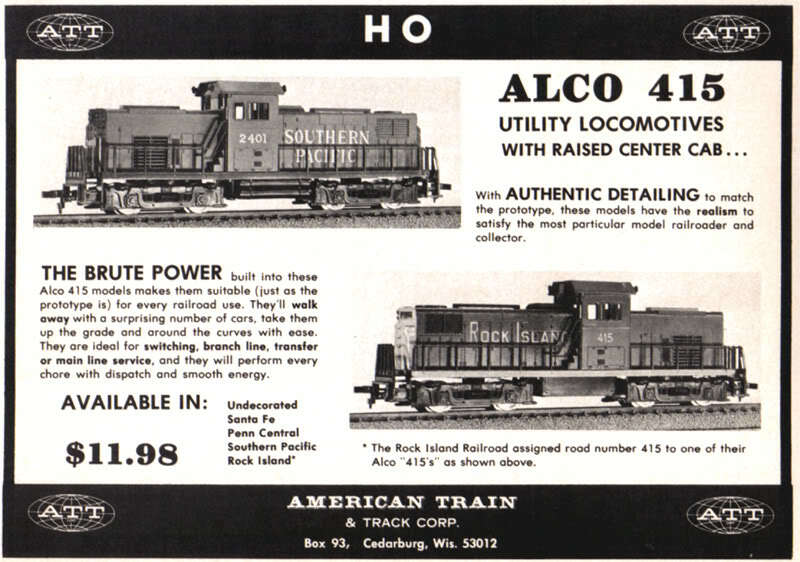 Alco only built 26 examples between 1966 and 1968 for a handful of railroads. The major railroads to purchase the Century 415 included Rock Island (medium-height cab with AAR Type B trucks); Spokane, Portland & Seattle (medium-height cab with Hi-Ad trucks); and Southern Pacific (high cab with AAR Type B trucks). 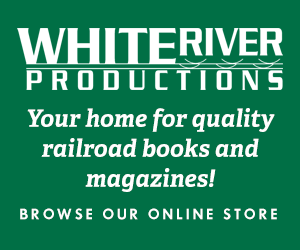 Other U.S. buyers included Monongahela Connecting Railroad (only low-cab version with Hi-Ad trucks) and Weyerhaeuser’s Chehalis Western Railroad and Columbia & Cowlitz Railroad (both received high cabs with Hi-Ad trucks). As noted, the prototypes present a mix of cab heights and truck styles. The Yugoslavian-made HO Century 415 sported AAR Type B trucks (two different toolings to date) and possessed a tall cab (similar to Southern Pacific and Weyerhaeuser railroad prototypes). The tooling is flawed by the inclusion of a round fan on the roof of the hood end with the radiator section. This fan appears to be close only to an Alco demonstrator Century 415 and didn’t see inclusion on production examples. 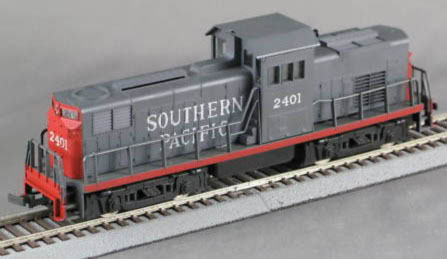 The model debuted as part of American Train & Track’s new line of HO-scale trains in 1969. The powered Century 415 diesel model came in four road names, as well as undecorated. The motor drove one truck on the model. The shell followed a design style employed by a number of Mehano-made locomotives with frame, pilot, and handrails being one plastic mold and the hood and cab being another plastic section. This design allows for tread pattern on walkways that was generally not found on models of this time period. A spotting feature of this Mehano approach to replicating diesels in HO scale was thick non-flexible plastic handrails. You’ll see this similar look on Mehano’s Century 628 (originally sold by Life-Like in the early 1970s), RS-11 (introduced by Varney just before 1970), GP18 (introduced in the mid-1970s by AHM), and other efforts. 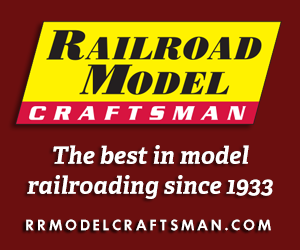 Though American Train & Track exited the hobby market soon after it arrived, this Century 415 has enjoyed a long stay in the world of model railroading. Life-Like imported a run in 1974 and it is thought Model Power next offered this model around 1980. IHC Hobby brought back an improved Century 415 from Mehano around 2000. That model featured improved looking AAR Type B truck sideframes and an all-wheel drive mechanism.